Most of us know that the potbellied pig in America today, can be traced back to Keith Connell’s import to the US from Canada (originally for zoos) in the mid-eighties. By today’s standards they were relatively large (60 to 80 kg), all black, wrinkled, particularly about the head and face with the other characteristics we associate with the “breeder”, usually referred to as the foundation stock. Keith named them the “Con Line”. However, shortly after the original importation, at least two other “breed types” were brought into U.S., the Lea Line” imported by Leavitt (gentle disposition, white and black markings,somewhat smaller) and the O’Royal LineO, imported by Espberger (mostly white, somewhat larger than the Lea Line). In fact, these pigs, Con, Lea and Royal represent most of the foundation stock found in America today. The different lines provide a larger gene pool to work with, give us a healthier breed type and enable breeders to develop more desirable characteristics (size, disposition, color, confirmation, etc) better suited for domesticated companion “House Pets”. The question is… Why is there such a wide variety of breed types in the first place?. To answer the question, we must first understand the origin of the species. Taxonomy- The potbellied pig is a direct descendent of the old world wild pig family. Order (Artiodactyla), Suborder (Suins),Family (Suidae), Genus(Sus Scrofa) the wild boar. Range-Spread across Eurasia, for over 40,000 years, they range from the Pacific to the Atlantic coast, and from the Mediterranean to as far North as the fringe of Siberia. The variety of habitat combined with the adaptability of this omnivorous (but mostly vegetarian) mammal has produced a wide variety of species which share many common traits (nesting, hair, spiked ears, etc). Potbellied Pigs- The potbellied pigs we share our homes and lives with, is generally associated with South East Asia and, in particular, Vietnam. It is technically not a breed(“a group of animals that have been selected by man to possess a uniform appearance that is inheritable and distinguishes it from other groups of animals within same species”), but a “local type”(generally indigenous to an area). The variety we see in America today is probably the results of the cross-breeding of four “local types” of Vietnamese pigs. They share many common characteristics (pointed ears, sway back, straight tail, pot belly, size and gentle disposition) and originate in different parts of Vietnam. North Vietnam- The OiO (The shortest breed type name in the world) is found in the West near the Red River Delta. It is the type most common in Vietnam and the pig known as the Vietnamese potbellied pig….the original “Con Line”. A larger pig (up to 90Kg) but still very small compared with domestic pigs. Its black skin is wrinkled, particularly about the head with a dished face, narrow forehead and small upright ears. The OMong CaiO is found in the Northeast near the Chinese border and Gulf of Tongkine. It is slightly larger than the “i” (100kg) with more hair, white with black head, white snout(sometimes a white star) and black patches elsewhere on the body (sometimes with saddle markings). This general appearance is associated with the Lea Line”. Central Vietnam: The “co” is very small (up to 40kg)pig . Originally wide-spread in central Vietnam, it is now restricted to the high plateau region. 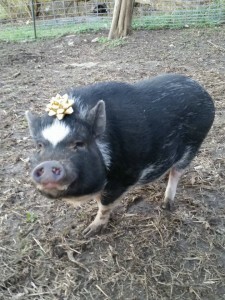 With a cubby body type (short) and more of a slope than sway to its back, it is obvious that this breed type has greatly influenced our “American” potbellied pigs. South Vietnam: The “Heo Moi” sometimes referred to as the Vietnamese primitive , originally roamed the mountain area on the South. Also very small (40-45 kg), they were sway backed with hanging stomachs and a longer snout. Today, mainly in the rich Mekong delta, they have been bred to be larger (60kg) but still possess veracity and many characteristics of their free-range mountain kin. Here too we see many of their traits in our American “breed types”. What to Look For: When looking for a pet, or going to a show, or just enjoying your own pet pig, see if you can spot the unique characteristics of the I, Mong Cai, Co, and Heo Moi breed types. Our judges are looking for a blending of many traits. All of us are looking for healthy, happy pets. Written by Richard Magidson, Ross Mill Farm Rushland, PA.
Used with permission from Susan Magidson.